The 2014 IAAF Continental Cup ended on a high for Team Africa despite finishing third in the final standings of the competition, which came to a close on Sunday at the Le Grande Stade in Marrakech, Morocco. The four continents which featured in the two-day meeting were Asia-Pacific, the Americas, Europe and hosts, Africa. The Europeans led by a mile, amassing 447.5 points overall while the Americas followed in second place with 390.0 points. Africa was third with 339.0 while the Asian-Pacific team settled for fourth with a total of 257.5points. Some of the major highlights of the event include the men and women’s 100m races which provided some excitement even in the absence of the continent’s top two female athletes in the event, Blessing Okagbare and Murielle Ahouré. Veronica Campbell-Brown was in awesome form as she blew away the rest of the field in the women’s 100m, taking the title with a time of 11.08s, after her Diamond League triumph two weeks ago in Zurich. Team mate and world No.2, Michelle Lee-Ahye who recently returned from a brief hiatus owing to injury took second with 11.25s while European double sprint champion, Dafne Schippers placed third in 11.26s. Team Africa’s Marie-Josee Ta Lou of Cote d’Ivoire and Gloria Asumnu were fourth and sixth respectively in 11.28s and 11.37s. The men’s 100m was an explosive race with the spoils being shared among European champion, James Dasaolu (10.03s), Mike Rodgers (10.04s) and Nigerian born Qatari sprinter Femi Ogunode who posted a Personal Best (PB) of 10.04s. Nigeria and Team Africa’s Mark Jelks took fourth with 10.12s while teammate and the continent’s fastest man, Hua Wilfried Koffi was unable to replicate the form that saw him scoop the sprint double a month ago, finishing a distant seventh 10.22s. The Americas led the 4x100m relays as Campbell-Brown anchored the female team to a top place with a time of 42.44s, while the African team comprising of Gloria Asumnu, Dominique Duncan, Ta Lou and Justine Palframan was disqualified. It was the same story in the men’s event as the team comprising of Kim Collins, Nesta Carter, Michael Rodgers and Richard Thompson took the race with a scorching PB of 37.97s. The African team, which was made up of the Nigerian quartet of Jelks, Obinna Metu, Edward Monzavous and Ogho-Oghene Egwero, clocked 39.10s to take third. Schippers coasted to victory in the women’s 200m in 22.28s, Ta Lou placed fifth with a PB of 22.78s while Duncan finished seventh with 23.63s, same position as Koffi in the men’s event. The Americas pair of Alonso Edward and Rasheed Dwyer clocked 19.98s in the men’s race, making it the second time ever at this competition that two men have gone sub-20 in the event. Ogunode picked another bronze in the event. The men’s triple jump event ended with a PB for winner, Benjamin Compaore (17.48m) and National Record (NR) for Mokoena (17.35m). Nigeria’s Tosin Oke narrowly missed out on a place on the podium with a fourth place finish, posting a jump of 16.89m. African and Commonwealth champion, Ese Brume had to settle for fifth position in the women’s long jump event with a leap of 6.34m. Europe’s Éloyse Lesueur won the event with 6.66m as world No.1, Tianna Bartoletta was relegated to third position with 6.45m. Stephen Mozia secured seventh position in the men’s discus throw with a distance of 57.31m in the event was won by Europe’s Gerd Kanter in 64.46m, while Chinwe Okoro finished sixth with a throw of 16.35m in the women’s shot put event. She took seventh position a day earlier in the discus event, recording a throw of 52.30m. African 110 hurdles champion, Tyrone Akins ran a Season’s Best (SB) of 13.48s to place fifth in his event while teammate, Juan De Vries finished in eighth position. Sergey Shubenkov (13.23s), Ronnie Ash (13.25s) and William Sharman (13.25s) emerged the top three in the event. Nigerian champion, Folashade Abugan finished sixth in the 400m but Zambia’s Kabange Mupopo was faster, securing the fourth position with a PB and NF of 50.87s, which was a remarkable feat achieved by the footballer turned sprinter. Mupopo is certainly one to watch out for in the near future! Despite the European invasion, there were flashes of brilliance from some of Team Africa’s representatives. First on the list is Cornel Fredericks outstanding performance in the men’s 400m hurdles on Day 1 of the competition. There was no slowing down the African and Commonwealth champion who raced to his third international title in 2014 in 48.34s, relegating the likes of Javier Culson to third position. His fellow African partner, Chris Morton placed fifth in 49.65s. Another spectacular performance was the 1-2 finish in the men’s 800m as Botswana’s Nijel Amos and Mohammed Aman outpaced their rivals to win the men’s 800m. Amos, the African and Commonwealth champion took the event in 1:44.88s, while his Ethiopian counterpart followed with 1:45.34s. Makwala was impressive in the 400m, following world No.2, Lashawn Merritt closely with 44.84s. The American and Diamond League winner took the race in 44.60s. More outstanding though was the Batswana’s feat in the 4x400m as his second leg run turned out to be the defining moment of the race, as he took over the lead from the Americas. Third and anchor leg runners, Saviour Kombe and Van Niekerk consolidated on his performance to gift the hosts a befitting gold medal in the final event of the competition with a PB of 3:00.02s. The Europeans (3:00.10s) followed while the Americas and Asian-Pacific teams placed third and fourth respectively in 3:02.78s and 3:03.77s. In the women’s category, the Jamaican led team raced to first position with a world of 3:20.93s, followed by Europe(3:24.12s) while the African team comprising of Mupopo, Abugan, Patience Okon George and Ada Benjamin posted a PB of 3:25.51s to place third. Other Africans who won their events include Egypt’s Ihab Abdelrahman El Sayed in the javelin throw (85.44m), Isiah Kiplangat Koech in the men’s 5000m (13:26.86s), Eunice Sum in the women’s 800m (1:58.21s), Genzebe Dibaba in the women’s 3000m (8:57.53s) and Jairus Kipchoge Birech in the 3000m steeplechase men (8:13.18). Nigeria’s GOLD winning team in the men’s 4x100m relay at the 2014 African Senior Championships in Marrakech are the sole bearers of Team Africa’s hopes in the event at the IAAF Continental Cup holding in Morocco this weekend. This season has been a long one for the team which participated first at the IAAF World Relays in May without a medal, and then the Commonwealth Games where they ran alongside world leaders, Jamaica in the heats and final. National 100m champion, Mark Jelks anchored the team to second position in the heats, just behind Jamaica which had the world’s fastest man, Usain Bolt in action. They eventually finished a sixth in a final which was won by the Jamaicans in a scorching 37.58s. It was an entirely different story at the African Championships as the Nigerian quartet comprising of Ogho-Oghene Egwero (No. 90 in the world this season with 10.18s), Monzavous Edwards (No. 78), Obinna Metu (No. 173 with 10.28s) and Jelks (No. 35) who was the anchor once again, dominated the event by clocking a Season’s Best (SB) of 38.80s ahead of Ghana (39.28s) and the Algerian team which sprinted to a National Record (NR) of 39.89s. Jelks and Edwards finished second and third respectively in the men’s 100m with SBs of 10.07s and 10.16s respectively, while the title was won by Cote d’Ivoire’s Hua Wilfried Koffi with an NR and Personal Best (PB) of 10.05s. However the 4x100m team would be without the services of Koffi who will focus on the sprint double at the forthcoming event. The Nigerian team is 34th on the 2014 IAAF 4x100m Relay rankings. The Americas team comes with an intimidating CV, having the likes of Richard Thompson (No. 2 with 9.82s), Michael Rodgers (No. 4 with 9.91s), Jamaica’s Nesta Carter (No. 8 with 9.96s) and veteran Kim Collins (No. 8 with 9.96s). All four athletes have done a sub-10 this season and are certainly the team to beat – it will be interesting to see how they do with their baton exchanges, given that the quadrennial continental cup is the only major competition that could see these sprinters of different nations competing on the same team! European champions, Team GB, will represent the continent in Marrakech. They won the continental crown in a very strong 37.93s. It comprises of Harry Aikines-Aryeetey (No. 40 with 10.08s), James Ellington (No. 59 with 12.13s), Richard Kilty (No. 51 with 10.12s) and Danny Talbot (No. 87 in 10.17s) – they will be expected to put up a good fight for the podium as the team ranks second on the 2014 IAAF rankings behind Jamaica. Asian champions and world No. 10 relay team Japan, with an SB of 38.34s, will be representing Team Asian-Pacific and is made up of Masaharu Mori, Masafumi Naoki, Yu Onabuta, Kazuma Oseto (No. 141 with 10.25s) and Kotaro Taniguchi. Amongst the four teams, it would seem that Team Africa are the underdogs, give them times each team has run this season, so it will be interesting to see if they can cause an upset! The IAAF Continental Cup will be taking place in Marrakech, Morocco THIS WEEKEND (Sept 13th & 14th), and Team Nigeria will be representing Africa in the men’s 4x100m on Saturday Sept 13th at 9.55pm! 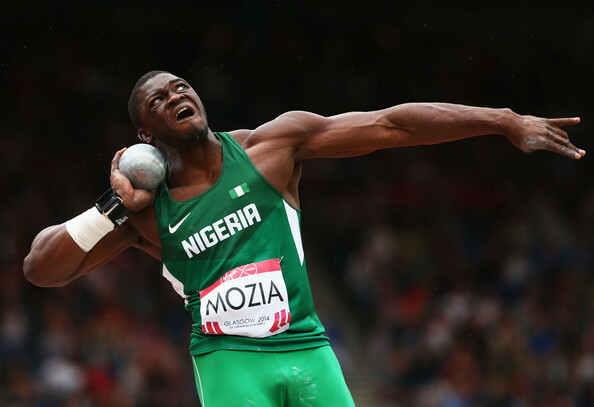 Stephen Mozia is Nigerian champion in the both the shot put and discus throws. However, he will be representing Team Africa at the IAAF Continental Cup this weekend in the discus throw only, alongside African champion, Victor Hogan of South Africa. 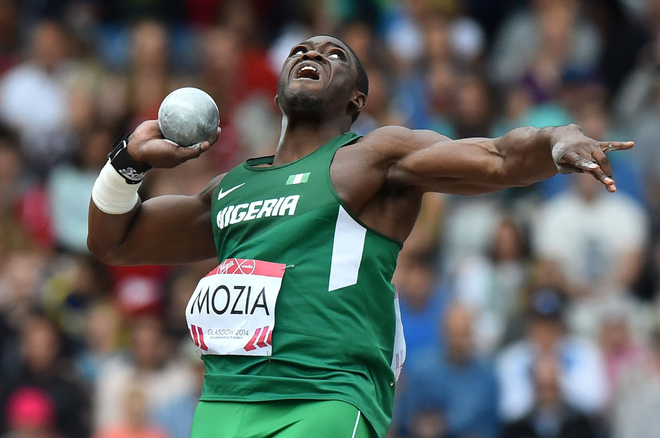 Mozia formally began competing for Nigeria at the World Indoors in Sopot this year, though he missed out on qualification for the final of the men’s shot put event. However, he had set a National Record (indoor) of 20.79m at the Ivy League Championships prior to the world indoors. The Cornell University senior went on to set an NR of 20.38m at the NCAA East Preliminaries in May, and then won the shot put at his debut outing during the National Trials in Calabar with a distance of 18.14m, followed by Augustine Nwoye who had a throw of 17.25m. He also dominated the discus event with 53.69m while Nwoye followed again with 53.28m. He competed at the Commonwealth Games in Glasgow where he finished 7th with a throw of 17.76m in the qualification round, ruling him out of the final. He placed fourth in the Men’s shot put final at the African Championships in Marrakech with 17.65m, while Nwoye finished in seventh with 16.90m. South Africa’s Orazio Cremona won with 19.84m. However he made up for this with a bronze medal in the discus with 57.11m, though his Season’s Best (SB) of 62.80m would have seen him claim silver as eventual winner, Hogan took the title with a distance of 62.87m, while team mate Russell Tucker with 62.15m. Mozia makes the selection into the African team since the top two in the event were from the same country and cannot both represent the continent. Mozia ranks 53rd in the world this year, with Hogan being twenty spots ahead (No.33) with an SB of 64.16m. The pair would be contending against World No. 7 and 24 respectively inTeam Americas’ Jorge Fernandez (66.50m) and Jason Morgan (64.72m). Gerd Kanter of Estonia (No. 10) would be spearheading the European attack and he comes with an SB of 66.02m. His teammate is Poland’s Robert Urbanek whose effort of 65.75m puts him at No. 17 on the rankings. Former Commonwealth champion and silver medallist at the last Continental Cup, Benn Harradine (No. 13) will be hoping to upgrade to a gold medal this time around and comes with a best performance of 65.94m. He is joined by Sultan Mubarak Al-Dawoodi (No. 132) in the Asian-Pacific team. The IAAF Continental Cup will be taking place in Marrakech, Morocco THIS WEEKEND (Sept 13th & 14th), and Stephen Mozia will be representing Team Africa in the men’s discus throw on Sunday Sept 14th from 6.50pm! Two years ago, the name Ese Brume barely rang a bell. The Delta State athlete has made tremendous progress since her 2012 National Sports Festival (NSF) win and has now been catapulted into international reckoning as she goes against the world’s best athletes at the forthcoming IAAF Continental Cup this weekend, where she will be representing Team Africa in the women’s long jump. The young athlete has garnered an enviable collection of titles and records, ranging from the African junior and senior titles, record holder in the African junior event, national champion and Commonwealth gold medallist! She finished second behind Okagbare at the National Trials in 2013 and stepped up to the position of national champion this year with a Personal Best of 6.68m in Calabar. Brume experienced a setback at the IAAF World Junior Championships in Oregon in July, where she failed to make it out of the qualifying rounds with a jump of 5.18m, despite coming to the championship as favourite for the crown. But she blew her fans away with an impressive comeback at the Commonwealth Games, leading the field with a leap of 6.56m and brushing aside threats from her more experienced rivals.She came to the African Championships in Marrakech as the favoured athlete and she didn’t disappoint as Nigeria made it a 1-2 in the event, with team mate Chinazom Amadi finishing second with 6.40m while Brume struck gold with a jump of 6.50m. She comes to the IAAF Continental Cup with Cameroun’s Joelle Mbumi who has a Season’s Best (SB) of 6.35m, which puts her at No. 133 on the IAAF 2014 Rankings while the Nigerian is No. 25. Brume told Making of Champions that she’s excited about competing in her first Continental Cup: “I’m looking forward to doing better at the IAAF Continental Cup where I will represent the continent. My dream is to become the world’s best”, she said. And so she will be going against the world’s best athlete in 2014 and IAAF Diamond League winner, Tianna Bartoletta of the USA (7.02m). Canadian Christabel Nettey who won bronze behind Brume in Glasgow will also compete in the Americas team. She is No. 19 in the rankings with a distance of 6.73m. Winner of the Zurich leg of the Diamond league series and world No. 3, Eloyse Lesueur (6.92m) and European Championships silver medallist, Ivana Spanovic (No. 8 with 6.88m) will be competing as well. They will be joined by the Asian-Pacific team comprising of Australia’s Margaret Gayen (No. 31 with 6.62m) and Lu Minjia (No. 41, 6.57m). The IAAF Continental Cup will be taking place in Marrakech, Morocco THIS WEEKEND (Sept 13th & 14th), and Ese Brume will be representing Team Africa in the women’s long jump on Sunday Sept 14th from 7.40pm! Nigerian sprinter Gloria Asumnu will represent Team Africa in the 100m at theIAAF Continental Cup in Marrakech this weekend, following the withdrawal of national, African and Commonwealth champion, Blessing Okagbare. The competition was meant to be Okagbare’s last outing for the season, but her sixth place finish in the 200m at the second final of the IAAF Diamond League in Brussels last week was perhaps an indication that the African record holder needed to take a break after a long and eventful season, which saw her emerge as double sprint champion at the Commonwealth Games in Glasgow and African title holder in Marrakech. Her place in the African team will now be taken by Asumnu, who finished second at the National Trials in Calabar in June where she clocked a Season’s Best (SB) of 11.15s. The former African 200m champion will now team up with Cote d’Ivoire’s Marie J Ta Lou Gonezie to represent the African continent in the 100m. Asumnu represented Nigeria at the Commonwealth Games where she placed eight in the final and won silver in the 4x100m behind Jamaica. She proceeded to the African Championships where she finished fourth in the final which had three Nigerians, with a time of 11.49s, while Lawretta Ozoh placed seventh in 11.74s. She also ran the first leg in the 4x100m race, which was won by Nigeria. However she lost her 200m crown to double silver medallist at the 2013 World Championships, Murielle Ahouré (22.36s), finishing fifth this time around, while team mate, Dominique Duncan emerged the surprise medallist, taking bronze in 22.98s. Asumnu’s SB puts her 36th in 2014 world rankings, and incidentally ranks higher than Ta Lou Gonezie who has posted 11.20s as her fastest time this season, and is 43rd on the list. They will be facing Michelle-Lee Ahye and Veronica Campbell-Brown who will be representing the Americas. Ahye has the second fastest time in 2014 (10.85s), while Campbell-Brown is No.4 with 10.86s. They would also have to be wary of the threat the European pair of Dafne Schippers and Myriam Soumaré pose, as they jointly occupy the 13th spot in the rankings with 11.03s and would be aiming to go under 11s for the first time. Asia-Pacific’s Melissa Breen (24th with 11.11s) and Olga Safronova (54th with 11.23s) complete the field. The IAAF Continental Cup will be taking place in Marrakech, Morocco THIS WEEKEND (Sept 13th & 14th), and Gloria Asumnu will be representing Team Africa in the women’s 100m on Saturday Sept 13th at 8.40pm. Chinwe Okoro set to represent Team Africa in discus and shot put @ Continental Cup! National discus champion, Chinwe Okoro, who won the African title last month with a Personal Best (PB) and Championship Record (CR) of 59.79m, will represent Team Africa at the IAAF Continental Cup in Marrakech in both the discus and shot put, after also getting an African Championship medal in the latter – a Silver. It was a 1-2 for Nigeria at the discus event at the Africa Championships, as teammate Nwanneka Okwelogu followed with 51.66m, but Morocco’s Amina Elmoudeen, who placed 3rd with a throw of 48.21m will be Okoro’s teammate at the Continental Cup on September 13 and 14, as two people of the same nation cannot represent the continent in the same event. 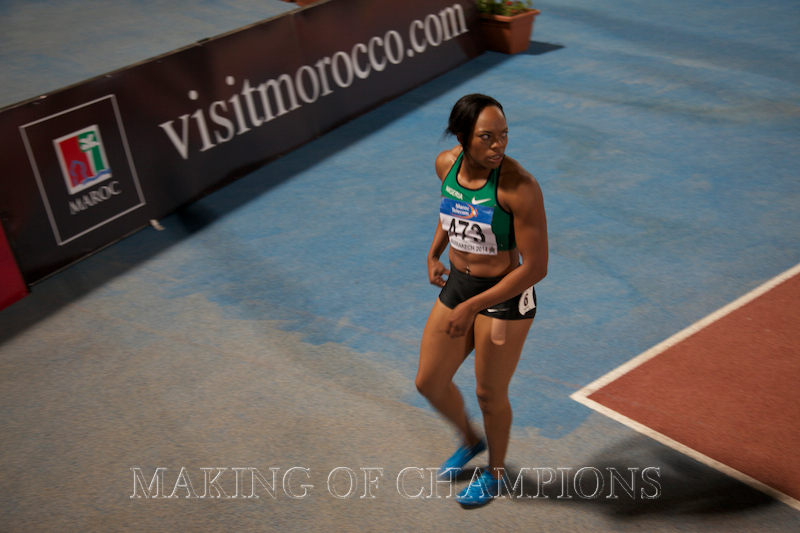 Speaking after her victory in Marrakech, Chinwe made no secret of the fact that she hopes to send more records tumbling in the near future: “It was my best performance, and my next goal is to realize the best record in the next competitions,” she said. Okoro’s throw in Marrakech makes her 42nd in the world this year, and she will be looking to break that 60m barrier at the Continental Cup! The woman to beat will undoubtedly be reigning European, World and Olympic champion, Sandra Perkovic (SB 71.08m), who won the 2014 Diamond Race, after dominating all but one of the seven meets for the discus. The world leader, along with France’s Melina Robert-Michon (world No. 12 with 65.51m) make up Team Europe. The duo of Gia Lewis-Smallwood (No. 2 with 69.17s) and Yaime Perez (No. 8 with 66.03m) will represent Team Americas, while Dani Samuels of Australia (No. 3 with 67.99m) and China’s Yang Yanbo (No. 20 with 63.31m) complete the field for Team Asia. In the shot put, Valerie Adams will be the woman to beat. She is the reigning world indoor and outdoor, Commonwealth and Olympic Champion, as well as defending champion of the Continental Cup. Adams won the Diamond Race last week in Brussels with a world lead of 20.59m. She and World No.4, Gong Lijiao of China (19.65m) are representing the Asia-Pacific. Christina Schwanitz (No. 2) and Evgeniia Kolodko (No. 5) will compete for Team Europe, having made throws of 20.22m and 19.52m respectively this year. Schwanitz is the reigning European champion and silver medallist at the last World Indoor and outdoor championships. USA’s Michelle Carter (No. 3) with an SB of 19.80m and Cleopatra Borel of Trinidad and Tobago (No. 7) complete the field. Okoro goes to the competition with an SB of 16.40m in the shot put, and is 108th in the world this year, while teammate and African Champion, Cameroun’s Auriol Sally Dongo (16.48m) is 76th in the world. Okoro freely admits that the discus is her preferred event, as such the African pair will no doubt benefit from the exposure that comes with competing against a top notch field! The IAAF Continental Cup will be taking place in Marrakech, Morocco THIS WEEKEND (Sept 13th and 14th) and Chinwe Okoro will be representing Team Africa in the women’s discus on Saturday Sept 13th from 7.50pm and the shot put on Sunday Sept 14th from 6.30pm.